It's fitting that a play about art is performed in a converted art gallery. Alex Hersler's Algorithmism is a talkie play about a future where art created by humans falls to the wayside when computers can do the work better. Hersler has a brilliant concept. It's a dialogue we likely never imagined possible but the reality of the situation is imminent. The trouble was that despite being broken into four scenes, Hersler's two-hander talks in circles. 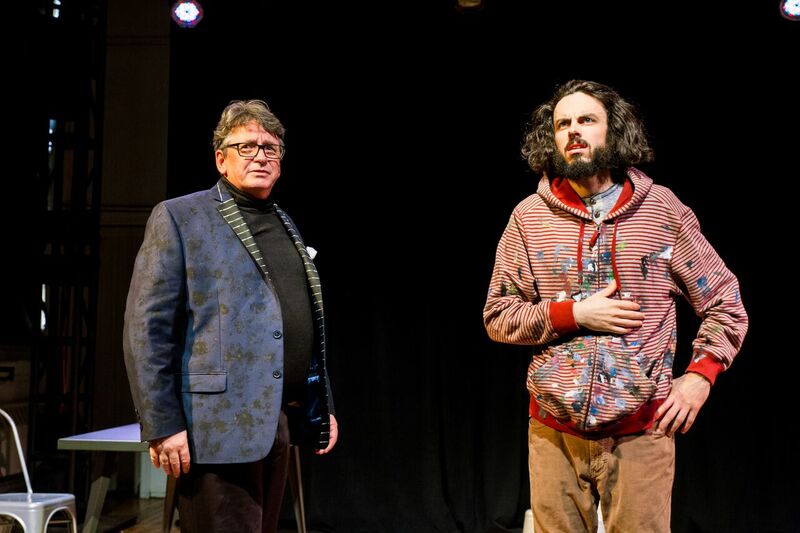 The story of art gallery owner Tom and his pride and joy artist Paul seems to lack character depth, instead opting for intellect. Finding a way to bridge the gap will be of great aid to Hersler. What's fascinating about Algorithmism is how one-sided the power shifts felt. As Tom, Terrence Montgomery controlled from start to finish. Montgomery tried to find any semblance of chemistry with scene partner Sean Shannon. What's ironic is how robotic Shannon's performance was. As the deadbeat, hipster artist Paul, Shannon was rigid and stuff, rarely moving from his planted position on stage. The direction by Richard C. Aven was focused in on the text. Rather than bring out the relationship, it was all about the complexity of Hersler's words. Despite the lighting woes of the space with house lights coming on and off, you can see the great design by Christina Verde. When it came to costumes, Susanne Houstle did a phenomenal job dressing Tom. The splatter jacket was brilliant. The slacker vibe from Paul didn't feel authentic to the prestigious career he was having. Overall, the message Alex Hersler provides in his play is promising. He's no John Logan but this really is an art play that wants to be discussed. With the execution slightly amiss, the potential of Algorithmism was never quite found.